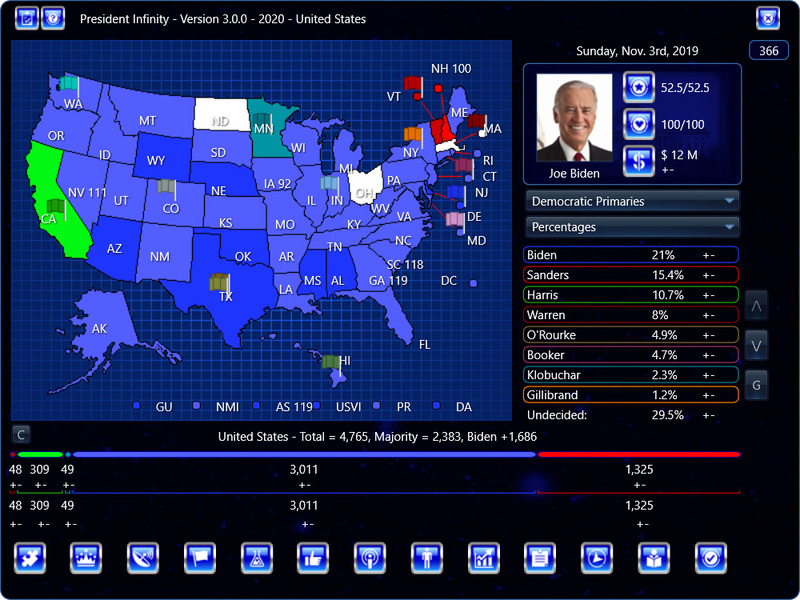 President Infinity v. 3.0.2 sneak-peek for Windows and Mac has been released! This sneak-peek fixes several bugs, adds Andrew Yang to 2020, updates primary dates in 2020, and more. Note: this version changes spacebarring to close various screens to ‘n’. What’s new in this upgrade from the previous sneak-peek (v. 3.0.1). Anthony, you need to focus some work fixing the third parties, in the general election, they all have 0’s in all their campaign stats which makes it impossible to get endorsers, impossible to spin news, and quite frankly, not very fun to play as. Related to my first point it seems all the Green Party candidates (and possible the Libertarians too, though I haven’t checked), have the same platform, the most egregious example being Jesse Ventura, who certainly is not for gun control, yet you have him calling for the banning of certain guns, among other errors, like for example I don’t think Ventura likes medicare for all, yet you have him down as far-left. Also there’s still no Mike Gravel. I’m actually helping Anthony with this scenario, since it is based off my base scenario. The 3rd party’s are actually turned “OFF” partially because we haven’t gotten to them yet. The Green Party candidates and their platforms aren’t well known outside of the general Green platform. Mike Gravel and any others will be added when they get 1% in a national poll. Until then, feel free to use the editor to amend Ventura. Better yet, you can let us know what you think his platform should be. Please provided any sources you use in creating his platform or any other Green Party member platforms. My assumption is that we probably won’t get to working on the Green or Libertarian Parties until sometime in the Summer when those parties start making the news with their candidates. It’s saying You can’t open the application “PI copy” because it may be damaged or incomplete? I’m using a mac. Poll from McLaughlin that was released March 25th has Marianne Williamson sitting at 1 percent. @Lucas, Williamson will probably be added soon, especially if she continues to get >= 1% in polls. Can you tell me the steps you take before you get that error (how you download it, and so on)? It should be very difficult to win major endorsements and so on as, say, a Green party leader. Three more polls from HarrisX puts her between 1 and 2 percent. Idealogue seems to be working backwards from how I thought it worked. Idealogue 10 means the AI would stay in for a long time despite going nowhere, while Idealogue 0 would be extremely likely to withdraw when things don’t go their way, right? The opposite is happening for me. Maybe I just misunderstood. Why the spacebarring was changed to ‘n’? We were used to spacebarring. Can you change it again? It was changed because the spacebar has standard functionality (such as clicking the button with the focus) on Windows and Mac. It took me a day to get used to the change. On Mac, when I went to simulate races (I just tried some 2020 matchups), the average/total figures on the top showed up, but not the individual sims below. Weirdly I could click on the blank spaces where the sim results would be, but I wasn’t able to see the results. When will the California Governor campaign be added? No specific ETA. It’s currently planned for Spring release (by June). @Thr33, thanks for this – noted. I have been unable to load my save file of the 2020 scenario on mac. Got it – will attempt to replicate. Trump – Most issue positions are correct. LGBT rights should be center-left. Transgenders should be a separate issue. Supreme Court Nominations: Far right – “Conservative activist judge” is an oxymoron. I think if you’re going to make him “far right” then the “right” position should be changed to “far right”. War on Drugs is off. Trump has been very vocal about hard drugs in the argument for the border wall, but the war on drugs is another issue, he’s been in support for medical marijuana. He should be center or c-left. Thanks for this – I’ve noted these to look at. @SirLagsalott re Ideologue rating, I’ve noted this to look into – thanks for this feedback. Just wanted to first say, thank you for fixing the ability to load a saved game! One of the things I’ve experienced for quite a while is that my candidate is never invited to appear on any of the television shows. This obviously means my candidate is missing out on some positive news coverage. Is there a way to fix this? Are you checking the various interview boxes on the spin form? First, thanks for the frequent updates. Is this leading up to a new big release or is these micro-updates the way it will be from now on? But the main reason for my post is that in the dropdown screen for choosing states, whether it’s for ads or campaign strategy or others, the up-down buttons on the dropdown box don’t operate, neither does the mouse wheel to scroll up and down. The only way to change states is to click the box and use the up and down keys on the keyboard. Not sure what this means. The most recent updates have been to continue updating 2020 and fine-tuning the Favorability feature. There are major features planned – some updates will contain bigger changes than others. Loving 2020 scenario so far. It looks like the shading for Warren is backwards- darkest shades are displaying for her vulnerable states and vice versa. Only problem I’m encountering so far. @anthony_270admin The dropdown boxes I refer to are anywhere there’s a region selection. I’m using it on Windows but I will test other computers to see if the same problem happens. One more question: How does the software know where to look for saved user scenarios? On my laptop, they go to my OneDrive, on my desktop they go to my Documents folder. I’d like to, if possible, access on both from the same location, i.e. my OneDrive, but when I installed PI on my desktop, it won’t see the OneDrive folder. So I guess my question is, what logic does the program use to determine where to save/load user scenarios, and is it ever possible that we can adjust this manually? That’s probably one of the most annoying things for me right now. Otherwise, love the updates! Is there going to be alternate modes of allocating electoral votes, such as a proportional system? @anthony270_admin Update on the dropdown error. I tried deleting the game and re-installing and the problem still occurs, but only happens in-game. So the problem is thus: When accessing the region select dropdown-menu in game play (not in campaign editor), the up-down arrows do not work, neither does the mouse scroll bar. The list cannot be scrolled up and down. The only way to go up and down the list is to use the keyboard up/down arrows.